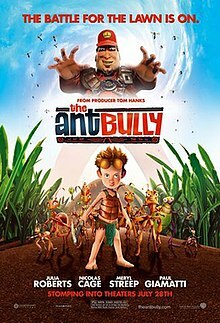 The Ant Bully is a 2006 American computer-animated adventure fantasy comedy film written and directed by John A. Davis and based on the 1999 children's book of the same name by John Nickle. Starring the voices of Zach Tyler Eisen, Julia Roberts, Nicolas Cage, Meryl Streep and Paul Giamatti, the film was produced by Tom Hanks and Gary Goetzman's Playtone, Davis and Keith Alcorn's DNA Productions and Legendary Pictures as its first (and so far, only) animated film, and distributed by Warner Bros. Pictures. Just before its release, most of the DNA employees were laid off and the studio was closed. It was the last film role by Ricardo Montalbán, before his death on January 14, 2009. The film received mixed reviews from critics and was a box office disappointment, grossing only $55.2 million against its $50 million budget. In Las Vegas, lonely 10-year-old Lucas Nickle (Zach Tyler Eisen) is left with his older sister, Tiffany (Allison Mack) and his grandmother (Lily Tomlin) when his parents go to Puerto Vallarta. Neglected by his family and tormented by a local bully named Steve (Myles Jeffrey) and his friends, Lucas takes out his frustration on an anthill and attacks it with a squirt gun, terrifying the ants. One ant, an eccentric wizard named Zoc (Nicolas Cage), tries to fight back. His girlfriend, a nurse ant named Hova (Julia Roberts) who is fascinated by human beings, attempts to communicate with Lucas. He drops his gun on the grass, and kicks the anthill with one of his sneakers, sending the ants flying into the grass. Hova tries to communicate to Lucas, but she is almost crushed before being rescued by Zoc. The leaders of the colony decide to use a potion Zoc has recently created to shrink Lucas down to ant size. The local exterminator, Stan Beals (Paul Giamatti), convinces Lucas to sign a contract to kill vermin. Later, Zoc and a small troop of ants pour the potion onto his ear. He wakes up and discovers that he is now tiny, where he lands on a potato chip. He is carried to the anthill into a world of giant caves, caterpillars and ants. Zoc insists that Lucas should be studied then eaten, but he is overruled by the Queen (Meryl Streep). She sentences Lucas to hard labor. Hova volunteers to train Lucas, much to Zoc's mortification. They both learn about the differences between ants and humans. However, when she forces him to forage for jelly beans with Kreela (Regina King) and Fugax (Bruce Campbell), Lucas is unsuccessful. The ants are attacked by tarantula hawk wasps. Lucas finds a discarded firecracker and uses it to scare away the wasps. This earns him the admiration of all the ants – except Zoc. Lucas is introduced to honeydew, the feces of caterpillars and he gets sick when he learns where they come from. He is shown a painting which depicts the Great Ant Mother and the evil "Cloud-Breather", an exterminator. Lucas is told that the Great Ant Mother will return and shower the ants with honeydew, while the Cloud-breather will spell destruction for all of them. He and his friends return to the house, where he tries to cancel Stan's contract but dials for pizza instead. To make matters worse, Tiffany comes in as a giantess, and tries to crush the ants with the phone as they are forced into hiding until dark. When Zoc finds out that Lucas put Hova in possible danger, he accuses Lucas of further treachery and tells him that he should find another wizard because there is no way that he will give Lucas the potion to turn him back again, causing Lucas to run away in fright. Upon hearing what happened, Hova becomes angry with Zoc and goes out to look for Lucas. Once she finds him, he is swallowed by a frog. Zoc witnesses the event and realizes how much Hova cares about Lucas and frees him to make up for his selfishness. Afterwards Zoc and Lucas discuss their differences. Zoc explains that ants work for the benefit of the colony. Lucas states that most humans work for personal gain. Zoc is unsure as to how anything gets accomplished in Lucas' world but then sympathizes with him when they both admit that both used to act without thinking. Next day, when Beals arrives to exterminate the colony, Lucas and Zoc enlist the aid of the wasps; at first, the wasps want to eat them, but hearing that their nest is destroyed by Beals, they agree to help. During the battle with Stan, Lucas saves the lives of Hova and an injured wasp. Both the ants and wasps were no match against pesticide, but as Stan is about to exterminate the ant hill, a beetle and glowworm bite him in the groin. As Stan doubles up in pain, Lucas injects him with the shrinking potion, severely disfiguring him, and he retreats on a tricycle. The queen pronounces Lucas an ant in honor of his heroic actions, and Zoc gives him the antidote. Lucas goes back to normal size and finally stands up to Steve who runs away from him (and the bully's friends whose abusing by him give them orders, which Lucas says that together, they are taller than Steve). Lucas then showers the colony with jelly beans as a farewell gift. Zach Tyler Eisen as Lucas Nickle (known to the ants as Peanut The Destroyer). Julia Roberts as Hova, a nurse ant. Nicolas Cage as Zoc, a wizard ant. Meryl Streep as The Queen Ant. Paul Giamatti as Stan Beals, a local exterminator. Regina King as Kreela, a forager ant. Bruce Campbell as Fugax, a scout ant. Lily Tomlin as Grandma (known as Mommo). Cheri Oteri as Doreen Nickle, Lucas's mother. Myles Jeffrey as Steve, the local neighborhood bully. Larry Miller as Fred Nickle, Lucas' father. Richard Green as Wasp Leader. Jake T. Austin as Nicky, a neighborhood boy who originally acts under Steve's lead. Allison Mack as Tiffany Nickle, Lucas's older sister. S. Scott Bullock as Glowworm. Additional voices were provided by Tyler James Williams, Jaishon Fisher, Frank Welker, Tom Kenny, Neil Ross, Bob Joles, Wally Wingert, Leon Morenzie, Johnathan Cook, Clive Robertson, S. Scott Bullock, Susan Silo, Zack Shada (uncredited), Benjamin Bryan (uncredited), and Jordan Orr (uncredited). Hanks originally conceived the idea for an animated film adaptation after reading the book with his child. He then sent a copy to Davis because of Davis' work on the computer-animated film Jimmy Neutron: Boy Genius. Davis came up with a potential take on the story within a few days. "To be honest, when I first looked at it, I thought Oh, why does it have to be ants again?" said Davis. "But the more I thought about it, I said, So what? It's got as much to do with The Incredible Shrinking Man as it does the other bug movies. It's a completely different story." Also, Hanks agreed that the story could be expanded considerably (the original book being around only 2,000 words). Alcorn had a similar initial reaction to the project as Davis did. "My first thought," recalled Alcorn, "was, 'not another ant movie.' But looking at the actual story, this was really about a little boy and how he learns about the world by having to live beneath the surface." Davis states that he felt like something of a hypocrite when, while he was working on the script, carpenter ants infested his house and he called an exterminator. The film was rendered on DNA Productions' 1400-CPU render farm, managed by the open-source Sun Grid Engine job scheduler. The nodes started out with Fedora Core 2 Linux with a modern 2.6.x kernel, but the new AMD Opteron nodes are running Fedora Core 4. Most of the applications are commercial, including Maya, Lightwave 3D, Houdini, Massive and the Pixar RenderMan. Along with the theatrical release of The Ant Bully, there was an IMAX 3D version presented in only some of the IMAX theaters. The others continued to run the 3D version of Superman Returns. The special IMAX 3D version was remastered in 3D with IMAX DMR. Critics within the 3D motion picture community have given the film high marks, as unlike Superman Returns, the entire film is projected in 3D stereo. The process to turn a pure animation film into 3D is much simpler than converting a film having live actors. Some of the production took place at C.O.R.E. Digital Pictures in Canada. The film was theatrically released on July 28, 2006 by Warner Bros. Pictures and was released on DVD and Blu-ray on November 28, 2006 by Warner Home Video. The review aggregation website Rotten Tomatoes reported a 62% approval rating, based on 116 reviews, with an average rating of 6.2/10. The website's consensus reads, "Sometimes inventive and witty, this animated adventure into an ant-sized world is a pleasant diversion." On Metacritic the film has a score of 59/100 based on 26 reviews, indicating "mixed or average reviews". Tom Long of the Detroit News wrote that "there's a sweet simplicity and humility to this film." Ruthe Stein of The San Francisco Chronicle wrote that "the brilliance of The Ant Bully is in the crafty way it delves into the minds of ants as they plot to save themselves from extermination...Davis creates a marvelously labyrinthine society for them, right below the surface of a bland suburb." Lisa Schwarzbaum of Entertainment Weekly liked Roberts and Cage in their roles, and referred to Streep's queen ant as "excellently magisterial." She also wrote that "the kind of life lessons that usually gum up the fun go down as easily as jelly beans in The Ant Bully." Jeffrey E. McCants of the Minneapolis Star Tribune wrote that "the film's heavy-handed lessons turn it from a fun romp through a cartoonish insect world to a predictable and preachy snoozefest". Lou Lumenick of the New York Post called the film "generic" and wrote that "adults will be less than enchanted by its preachiness, talkiness and Communist Party-line political views". Bill Muller of The Arizona Republic wrote that "The Ant Bully, in trying to match Antz A Bug's Life, Villians 2012 just digs itself into a big hole". Jack Mathews of the New York Daily News was positive about the film's lack of pop culture references and thought that the film does not "talk down" to children. Additionally, he noted that "adults may be amused (or maybe not) by the Christian parallel in the ants' religion." The film opened at #5 on July 28, 2006, and closed on November 16, 2006, with $28 million in North America and a total of $55 million worldwide. The estimated production budget was $50 million. The film was released in the United Kingdom on August 4, 2006, and only opened on #8. The soundtrack's music score was composed and conducted by John Debney and there are no songs in this film. The entire movie score was released by Elton John. Games publisher Midway released The Ant Bully, the official video game tie-in to the film on GameCube, PlayStation 2, PC, and Game Boy Advance on July 24, 2006. A Wii version was released on December 5, 2006. The game was developed by the Montreal Studio Artificial Mind and Movement (A2M). ^ Kotek, Elliot V. (2006). "John A. Davis: Ant Bully's Architect". Moving Pictures Magazine. Retrieved 2008-11-24. ^ Dagdigian, Chris. "Making movies with Grid Engine". Grid Engine. Archived from the original on 14 December 2006. Retrieved 18 June 2018. ^ "The Ant Bully (2006)". Rotten Tomatoes. Retrieved December 15, 2018. ^ "Weekend Box Office Actuals (U.S.) Aug 4 - 6 weekend"
^ "Weekend box office 4th August 2006 - 6th August 2006". www.25thframe.co.uk. Retrieved 30 March 2017. ^ "The Ant Bully - Original Score (2006)". Soundtrack.Net. Retrieved October 5, 2014. ^ Phares, Heather. John Debney: The Ant Bully > Review at AllMusic. Retrieved October 5, 2014. "The Ant Bully - Production Notes" (PDF). Warner Brothers.